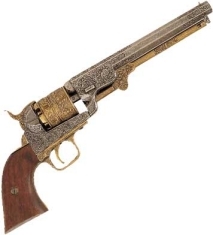 We have Civil war pistols, actually replica civil war pistols for Collectors, stage and movie props, display, fake civil war pistols to buy online, reenactments and theatre that are Museum quality. 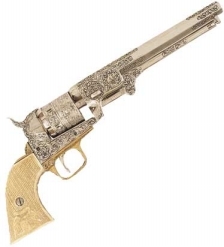 They are great Civil War replica pistols for sale online for gifts or for you..
Civil War Confederate Revolver: The Southern percussion six-shot cap and ball revolver circa 1860, was manufactured by Griswold and Gunnison near Macon, Georgia. Action works like the original. 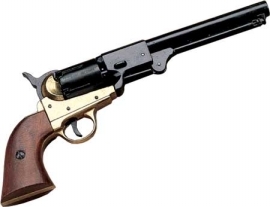 Length: 13.5", Weight: 2.1 lbs. Civil War Confederate Revolver: The Southern percussion six-shot cap and ball revolver circa 1860, was manufactured by Griswold & Gunnison near Macon, Georgia. Action works like the original. Length: 13.5", Weight: 2.1 lbs. 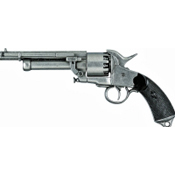 Cogswell Pepperbox Revolver: Developed in London in the mid 1800's, this six shot percussion pistol with mechanically revolving barrel working action has wood grips.Features: Length: 8.5", Weight: 2 lbs.